If respectable, middle-aged rock 'n' roll is suddenly enjoying a second childhood, then the Traveling Wilburys are the superstar enfants terrible of the back-to-basics movement, major artists and elder statesmen who've joined forces to collectively cast off the onus of artistic sobriety. And proud of it, man. "There's nothing worse than a serious pop singer," says Tom Petty, prompting laughter from his fellow bandmates at the table, George Harrison and Jeff Lynne -- all Wilburys and each one a convicted Ex-Serious Pop Singer in his own right. Fans who first heard that these three were getting together with fellow rock legends Bob Dylan and Roy Orbison in 1988 to record an album might have expected some sort of timely summit from these beacons of several generations. Instead, the Wilburys took the only logical approach that important talents can take in collaboration: serious slumming. A classic of deadpan humor and sly nods to pop tradition, it was more of a barroom battle of the bon mots than a weighty meeting of the minds. Orbison died shortly after the release of the heralded "Vol. 1" album two years ago, but the four remaining members have recorded a follow-up, purposely misnamed "Vol. 3." Released in October, it is currently climbing the charts. And, if anything, this delightful and defiantly unimportant album is even rootsier and even cornier than the first one. "You can still say things while you're lightening up," Petty says, "But I think we're all weary of people who come on for an entire LP ... and give you the impression that this person is trying to tell you real serious things that they couldn't possibly have an impact on. A lot of the lyrics that I hear on the radio these days sound pompous. I'm not against people being serious with their work, I just think they have to be careful that it doesn't come off as pretentious." The loose, roughneck Wilbury spirit has infected the solo work of its individual members as well. Though it was recorded prior to the Wilburys' working together, Harrison's last solo effort, the comeback "Cloud Nine," showed evidence of a definite lightening of sensibilities -- as do Lynne's "Armchair Theatre" and Petty's smash hit "Full Moon Fever," both post-Wilbury releases. And Dylan? One listen to "Wiggle Wiggle" -- the leadoff track that treads the fine line betweens sexual suggestiveness and infantilism -- demonstrates beyond the shadow of a doubt that he, too, has succumbed to Wilbury-itis. The three Wilburys on hand for this interview admit that their more serious instincts tend to melt away when they're around one another. Says Petty, "I think that last album (the Lynne produced "Full Moon Fever") was more like me, more honest in a lot of ways, than a lot of them I've made. I feel like I'm more comfortable being myself than I have been in a while. Because I've always had a sense of humor, but I (used to feel) that if I used it, that it would perhaps give the impression that I was throwing away things or just fooling around." Harrison concurs that working with the Wilburys "gave us a big more freedom than we'd have had individually," says Harrison. "Well, I'm talking about us three, not really Bob. He always did what he wanted when he wanted all the time." The first and most obvious question this time around: What happened to "Vol. 2"? "We haven't made that yet," quips Harrison. "Is that an obvious enough answer?" The title is indeed probably just an offhand joke -- just as the group's moniker is -- though one might speculate that the missing volume could be, by implication, a sort of tribute to the missing Orbison, and what could have been had he lived to record with the group further. In the two years since the release of the first Wilburys album, most speculation centered on whether there would even be a follow-up, and if so, who would replace Orbison in the lineup. Veterans Del Shannon and Roger McGuinn were most often named, perhaps because Lynne produced some tracks for Shannon (who has since committed suicide) and Petty did some studio work with McGuinn. The group dismisses the idea of a need for an Orbison replacement out of hand. Says Petty, "Whoever we worked with after that album was 'the next Wilbury'" -- but only in the imaginations of the press and other onlookers. "It never came from us or Del Shannon or Roger McGuinn." Harrison maintains that it never occurred to the surviving members to bring someone else in because "we didn't really bring Roy in. He just happened to be there, you know, and that's how it came about. So there was no reason to go looking for somebody ... I mean, there's already enough of us, anyway." 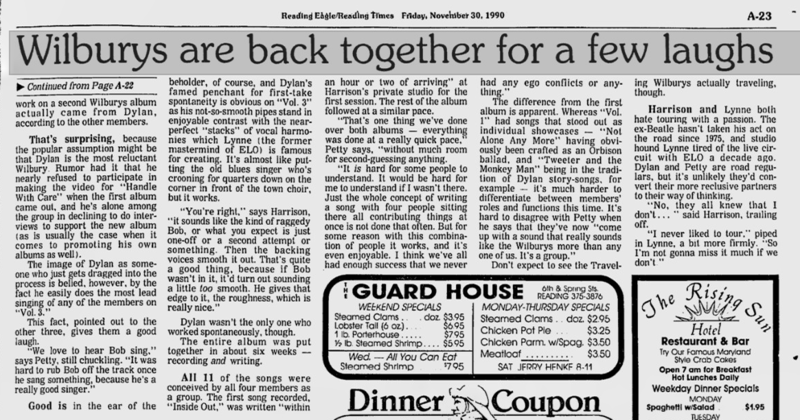 Harrison, Petty, and Lynne had all worked together on various projects in the meantime, but the instigation to dig in and begin work on a Wilburys album actually came from Dylan, according to the other members. That's surprising, because the popular assumption might be that Dylan is the most reluctant Wilbury. Rumor had it that he nearly refused to participate in making the video for "Handle With Care" when the first album came out, and he's alone among the group in declining to do interviews to support the new album (as is usually the case when it comes to promoting his own albums as well). The image of Dylan as someone who just gets dragged into the process is belied, however, by the fact he easily does the most lead singing of any of the members on "Vol 3." This fact, pointed out to the other three, gives them a good laugh. "We love to hear Bob sing," says Petty, chuckling. "It was hard to rub Bob off the track once he sang something, because he's a really good singer." Good is in the ear of the beholder, of course, and Dylan's famed penchant for first-take spontaneity is obvious on "Vol. 3" as his not-so-smooth pipes stand in enjoyable contrast with the near-perfect "stacks" of vocal harmonies which Lynne (the former mastermind of ELO) is famous for creating. It's almost like putting the old blues singer who's crooning for quarters down on the corner in front of the town choir, but it works. "You're right," says Harrison, "it sounds like the kind of raggedy Bob, or what you expect is just one-off or a second attempt or something. Then the backing voices smooth it out. That's quite a good thing, because if Bob wasn't in it, it'd turn out sounding a little too smooth. He gives that edge to it, the roughness, which is really nice." Dylan wasn't the only one who worked spontaneously, though. The entire album was put together in about six weeks -- recording and writing. All 11 of the songs were conceived by all four members as a group. The first song recorded, "Inside Out," was written "within an hour or two of arriving" at Harrison's private studio for the first session. The rest of the album followed at a similar pace. "That's one thing we've done over both albums -- everything was done at a really quick pace," Petty says, "without much room for second-guessing anything. "It is hard for some people to understand. It would be hard for me to understand if I wasn't there. Just the whole concept of writing a song with four people sitting there all contributing things at once is not done that often. But for some reason with this combination of people it works, and it's even enjoyable. I think we've all had enough success that we never had any ego conflicts or anything." The difference from the first album is apparent. Whereas "Vol. 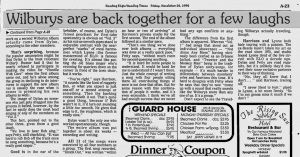 1" had songs that stood out as individual showcases -- "Not Alone Any More" having obviously been crafted as an Orbison ballad, and "Tweeter and the Monkey Man" being in the tradition of Dylan story-songs, for example -- it's much harder to differentiate between members' roles and functions this time. 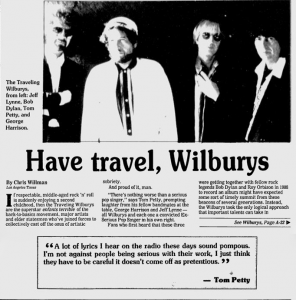 It's hard to disagree with Petty when he says that they've now "come up with a sound that really sounds like the Wilburys more than any one of us. It's a group." Don't expect to see the Traveling Wilburys actually traveling, though. Harrison and Lynne both hate touring with a passion. The ex-Beatle hasn't taken his act on the road since 1975, and studio hound Lynne tired of the live circuit with ELO a decade ago. Dylan and Petty are road regulars, but it's unlikely they'd convert their more reclusive partners to their way of thinking. "No, they all knew that I don't..." said Harrison, trailing off. "I never liked to tour," piped in Lynne, a bit more firmly. "So I'm not gonna miss it much if we don't."